Prins is a former Wall Street executive. 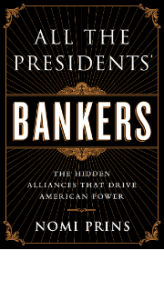 Her books include All the Presidents’ Bankers: The Hidden Alliances That Drive American Power. She just wrote the piece: “Dear President Trump: Breaking Up (Banks) Isn’t So Hard to Do — Glass-Steagall or Another Economic Meltdown?” for Tom Dispatch. “Under President Obama, the 2010 Dodd-Frank Act was signed into law. The Act sought to limit the ability of big banks to trade the riskiest types of securities. Through inclusion of something called the ‘Volcker Rule,’ Dodd-Frank prohibited the trading of securities (even if with many loopholes). What it didn’t do was actually break up the big banks again. That meant another 1933 still awaited its moment.